EnviroDEFENSE® LagoonClear tablets contain multiple strains of strong, sludge removing bacteria designed to work at the problem source. When applied EnviroDEFENSE® LagoonClear tablets sink into the sludge and begin to breakdown leaves, twigs and sunken organic material that contribute to the sludge layer. By removing these contaminants the result is less sludge and odor, less dredging and hauling and reduced chances of governmental fines. When applied correctly EnviroDEFENSE® LagoonClear tablets guarantee up to five inches of sludge removal in one year. 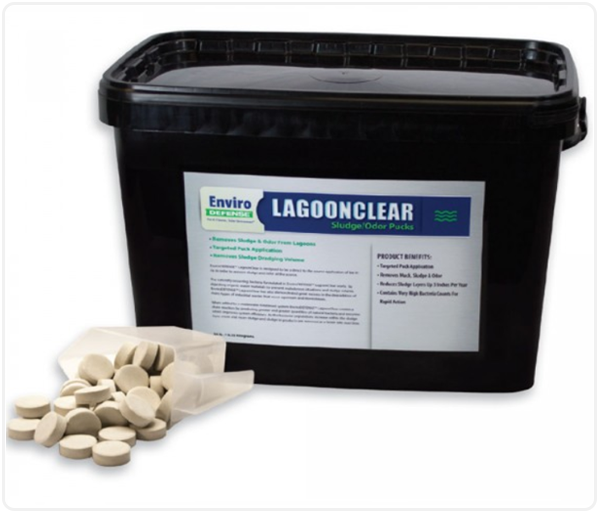 PRODUCT SPECIFICATIONS: EnviroDEFENSE® LagoonClear contains targeted enzymes and bacteria stains formulated in an easy to apply, targeted tablet application delivery method. EnviroDEFENSE® LagoonClear contains a minimum of 5 Billion CFU/gram. For Routine Treatment: Apply ½ lb. (227 g) for every 5000 m3 of water every week. For Severely High Level of Accumulations: Apply 1 lb. (454 g) for every 5000 m3 of water every week. Optimum time of use should be: 3-5 p.m.
Water must be free of chlorine/chemicals that will kill beneficial bacteria. The field study below shows the reduction of sludge by EnviroDEFENSE® LagoonClear Tablets. Each spring, the client’s water level drops to handle the flow of new water for the rainy season. While the water level is down, the first 20 feet of shoreline is exposed. The middle photo shows the client’s beach area after three months of use. The side photos show the neighbors to the left and right that had no treatment.